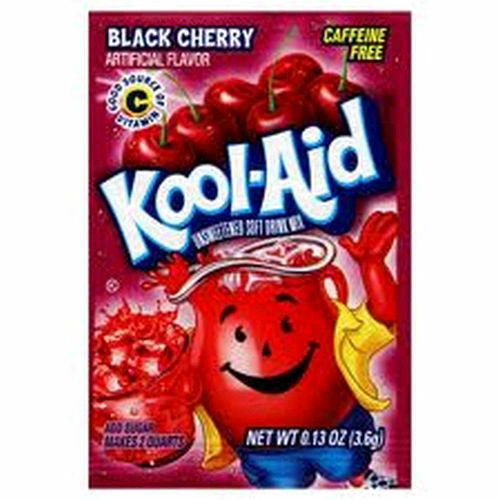 For sale is 10 /.13 oz packs of Black Cherry Kool-Aid. Each packet makes 2 quarts. Just add cold water, ice, and 1 cup of sugar. All product good till 12-16 or beyond. Kool-Aid was invented by Edwin Perkins and his wife Kitty in Hastings, Nebraska, United States. All of his experiments took place in his mother's kitchen.. Its predecessor was a liquid concentrate called Fruit Smack. To reduce shipping costs, in 1927, Perkins discovered a way to remove the liquid from Fruit Smack, leaving only a powder. This powder was named Kool-Aid. Perkins moved his production to Chicago in 1931 and Kool-Aid was sold to General Foods in 1953. Hastings still celebrates a yearly summer festival called Kool-Aid Days on the second weekend in August, in honor of their city's claim to fame. Kool Aid is known as Nebraska's "official soft drink".